It's been a journey trying to figure out the best way to empower both end users and theme developers over which parts of their site are served as AMP, and whether AMP is served as canonical or is available in paired mode. ℹ️ The commits in this PR will be squashed/rebased when merged, so please excuse the messy commit history in this branch. 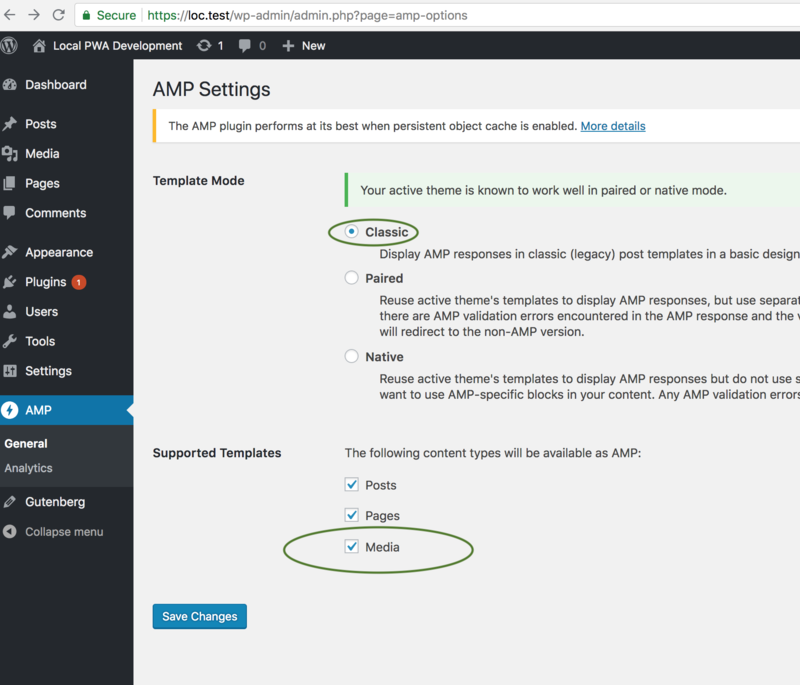 The supportable templates are organized hierarchically according to the WordPress template hierarchy, so you enable the Category template for AMP but the general Archives template is disabled, then the Category template status will override the Archives template status. The availability of this option may will be determined whether or not a theme/plugin is forcibly setting the supported status for a given template. The template hierarchy is now exposed in the admin screen allowing the user to specify which kinds of templates should be served as AMP. 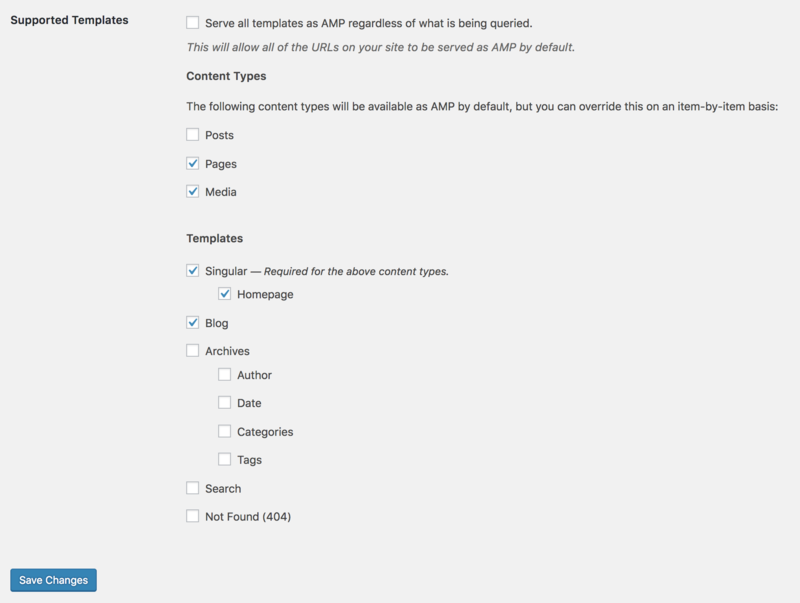 The amp_supportable_templates filter allows you to customize the template hierarchy, add recognition for new template types, and force certain templates to be supported or forbidden in AMP. 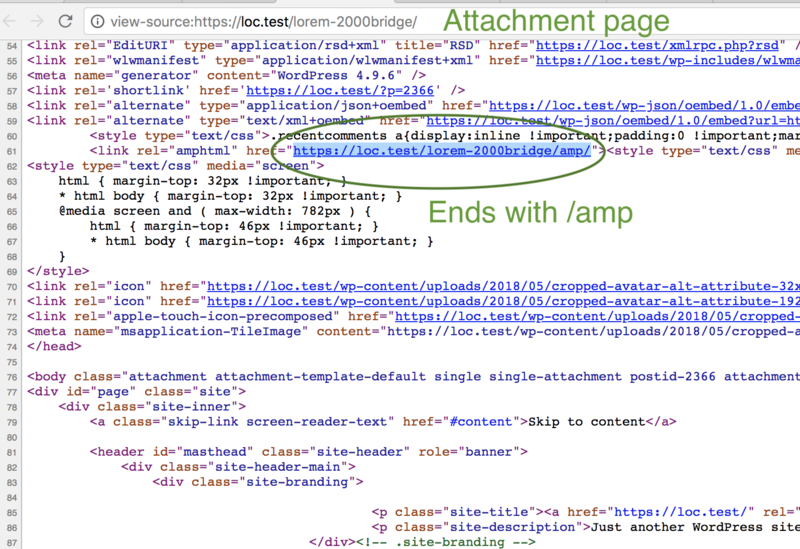 There is a new templates_supported arg on the amp theme support which can take a value of 'all' to force AMP to be available on all templates, or else an array mapping template IDs (e.g. is_search) to whether they are supported. The “Post” post type can now be turned off instead of always being forcibly enabled. When amp theme support is present, the static homepage and page for posts are both enabled by default, as are pages with custom templates assigned. 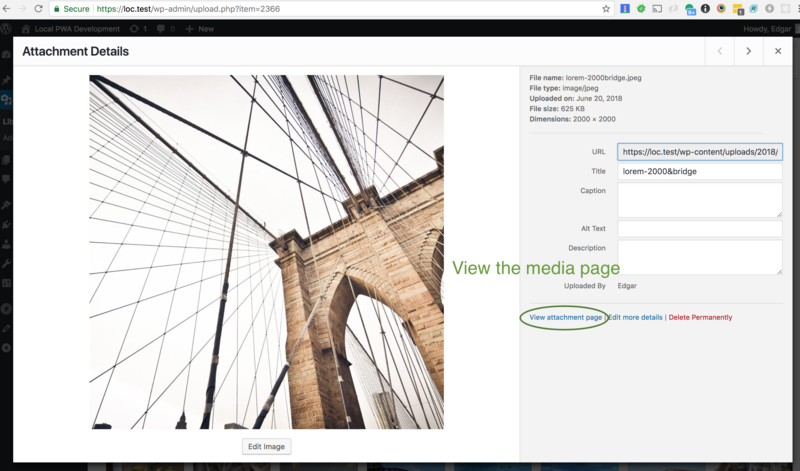 The template mode is now explicitly indicated via a mode theme support arg, which can either be native or paired. The template_dir can now be used in native mode as well. You can now define add_theme_support( 'amp', array( 'mode' => 'native', 'optional' => true ) ) where the optional flag allows you to bypass actually activating the support in code, but forcing the mode to be native if they do add support. This allows the user to define comments_live_list in the theme without forcing AMP support to be present. 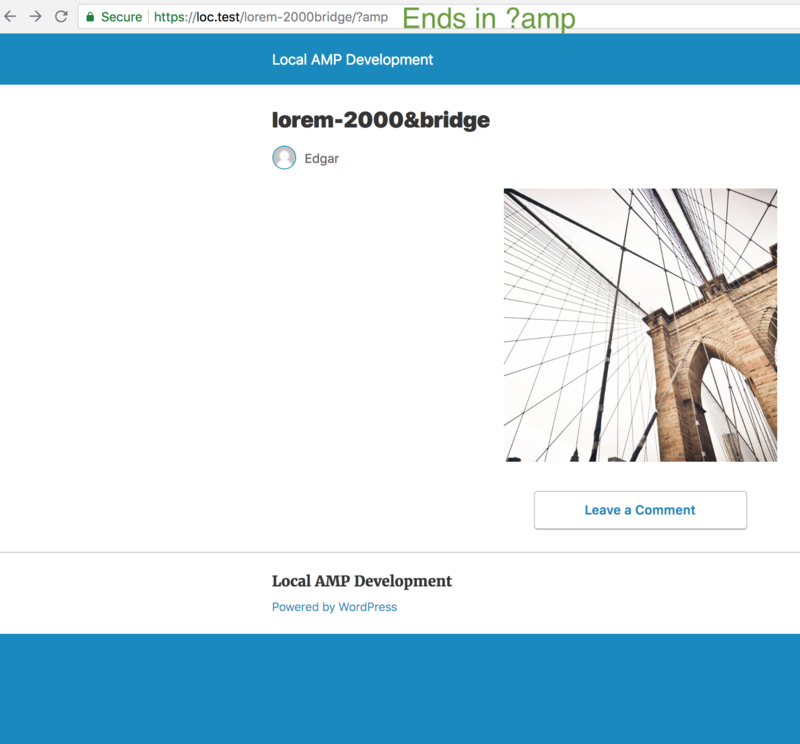 Loading AMP component scripts has been restored on a native-mode site where AMP content appears on a non-AMP page. The post_supports_amp() logic has been consolidated into AMP_Post_Type_Support::get_support_errors(). ❗️ Breaking change: The available_callback has been eliminated. The restriction that is_amp_endpoint() cannot be called prior to parse_query action has been restored. Determine how a theme can force AMP to be used on all templates. If mode is native and AMP components are being used in all templates, then the theme needs to force all responses to be AMP. This could be done by a theme setting supported to true for all the amp_supportable_templates, but it seems there should be an easier way. 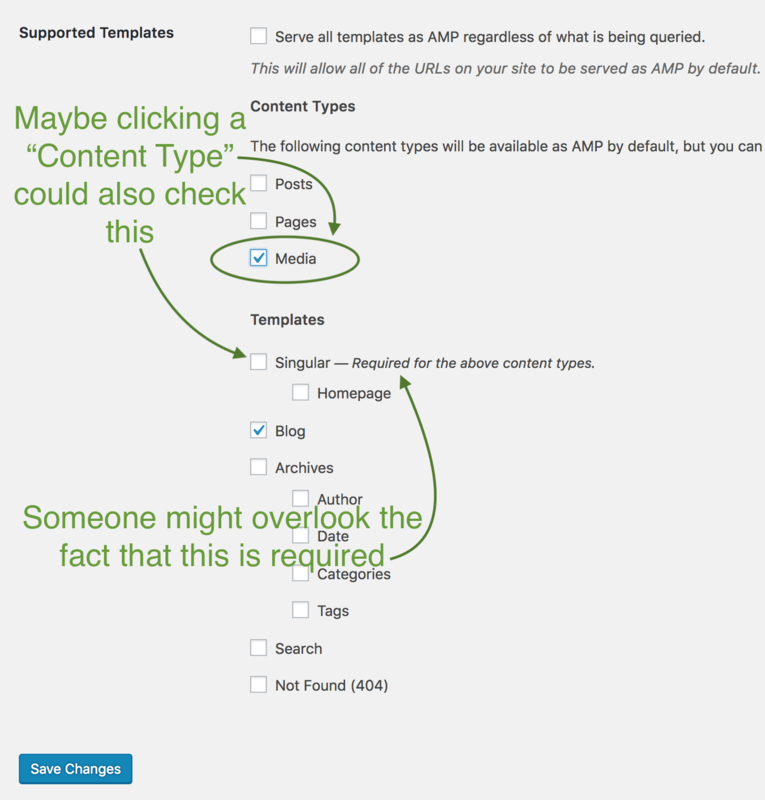 Add an “other” option to determine if AMP gets served by default for any templates not explicitly called out. This would be used in particular for template_redirect templates that are not loaded normally. Should there be a way for a theme to explicitly mark templates as requiring for AMP other than by using the filter? An all_templates_supported flag on the theme support as a shortcut for using the filter? There could be a templates_supported arg when defining theme support which can take either 'all' or an array of the template conditions which then become immutable. Restore facilitation of serving AMP components in non-AMP documents if mode is native. The fine-grained control in the UI is great, and should help more people to use Native AMP. Being able to opt out on Native AMP templates should help if there is important JS. // Check if the queried object supports AMP. 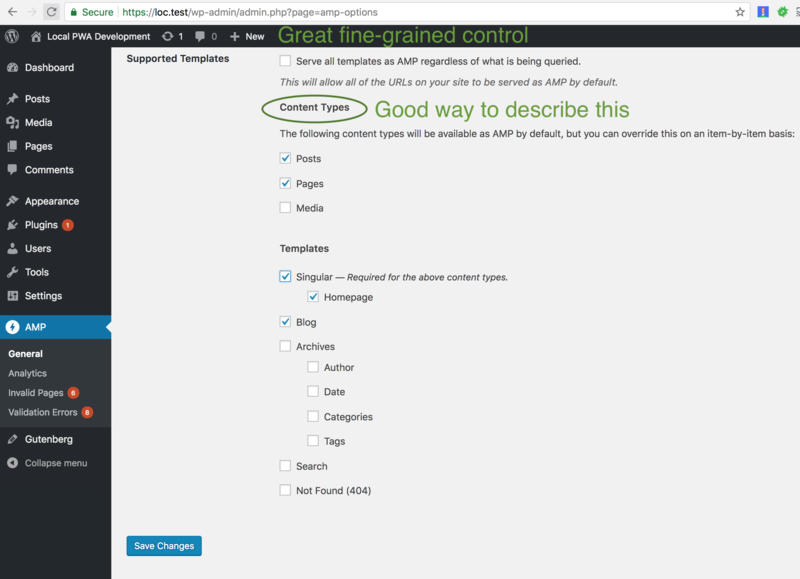 * Determine whether theme support as added via option. * @param array $templates Supportable templates. This filter is already well-documented, and this PR is WIP. But maybe it could also mention that each $template in $templates can have an $id or 'callback' that is a method of WP_Query (if I understand this right). Or it can simply be a callable. id="<?php echo esc_attr( $element_id ); ?>"
name="<?php echo esc_attr( $element_name ); ?>"
value="<?php echo esc_attr( $post_type->name ); ?>"
The first argument of checked() probably isn't needed. If they're checked by default, that might communicate "will be available as AMP by default"
Actually they would be available as AMP by default, no? Yes, they would be available by default. But I was thinking that it might not be necessary to mention that. But on second thought, that description is probably helpful. Most people probably don't want to disable AMP on posts, for example. @kienstra I like the idea of making it simpler for people, so that if they select a content type the singular template would be auto selected. Is there ever a situation where I would select a singular template and NOT select a content type? @jwold Yes, it would probably be common to have the Singular template checked but not have all Content Types checked. 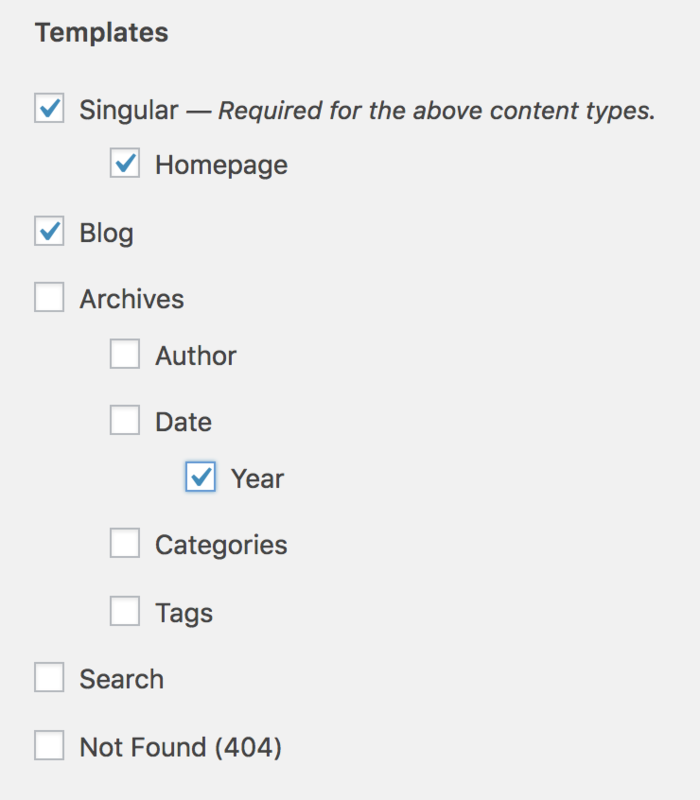 What would probably not be as common is to have Singular unchecked but the Content Types checked. There is a scenario where it could be used though: maybe the post archive page for a given CPT can be served as AMP but the singular CPT template cannot. That would surely be rare, but even so the “Required“ comment above isn't really true. 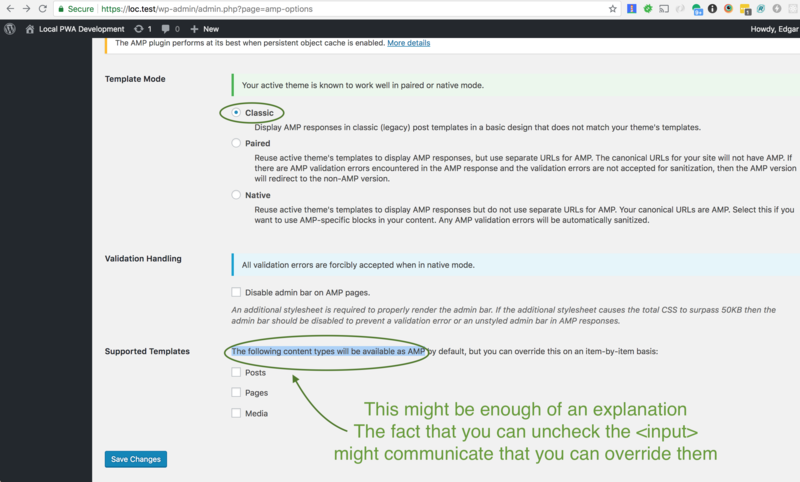 * Make sure admin screen shows proper options when optional amp theme support has been disabled. @westonruter works really well with custom templates in plugins as well. Thanks for doing this. Revert "Remove dirty AMP support; rename Disabled to Classic"
This reverts most of commit 5bae33e. Ready for review and testing. With this merged, I believe we're ready for beta. May there be a more differentiating naming for current_theme_supports vs. get_theme_support? Probably I am missing some of the context but the naming appear a little confusing. The current_theme_supports() and get_theme_support() are WordPress core functions. They are somewhat confusing. The former returns whether support has been added (boolean), and applies a filter to let plugins control whether support is present. The get_theme_support() on the other hand does not apply a filter, but rather it returns the args that were passed in for the original add_theme_support() call. This comment is hard to follow; perhaps not mentioning "Dirty AMP" first, but explaining directly the semantics of the filter and action functions may be clearer. Then the concept of Dirty AMP can be expressed. Just a thought. No need to look/address this now. Would it be possible having a comment for this if-then-else? To explain why the condition is here? Lots of work went into this. There are some parts of the changes which were challenging to follow; but they are sound. LGTM. Ship it! // Support available_callback from 0.7, though it is deprecated. This looks good, and it's a big step in making the plugin easier to use. I only found one thing (below), related to media pages in "Classic" mode. The "Supported Templates" UI worked as expected in Paired and Native mode. I tested enabling and disabling "Posts," "Categories," "Homepage," "Search," and "Not Found (404)." This isn't the most common use-case. But it looks like on the "Media" pages in "Classic" mode, the href in the <link rel="amphtml"> leads to a 404 page. 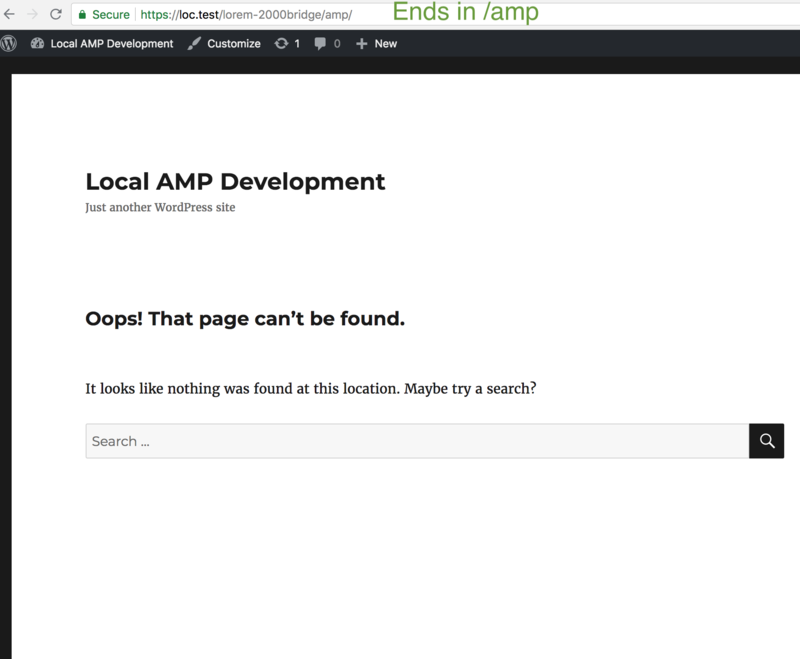 It ends with /amp, which results in a 404 page. But the ?amp URL works. On the "AMP Settings" page, select "Template Mode" > "Classic," and check "Supported Templates" > "Media"
This seems to exist even after flushing permalinks. Good catch. I believe this is fixed after 7091b35. Thanks, your commit 7091b35 fixed this, and the <link rel="amphtml"> now leads to a valid AMP page.